Are You Ready to QuantumLeap Your Results? For only $47 you can attend every webinar and gain access to the replays for life. - They're Working Against You!! Think about that for a minute. Which is happening to you right now? How many thousands of dollars are you losing out on that you aren't even aware of? What is the goal of your website? What is the goal of your online presence? Most people out there doing websites are designers, not marketers, so the goal for them will be to make it look pretty, feel cool, not what will help convert traffic into sales. It's the hidden secret in the industry because nobody asks them - when building my site, what direct marketing response triggers will you be using when you do the layout, color selection, branding, and navigation? If you want to see a deer in the headlights - ask that question - the most important question to your marketing needs. I have met so many people that have spent almost $20,000 on a website that does nothing, and spent thousands on branding, to get them a look that was never aimed at their target market - because it was never identified. The reality is your online platform is your biggest marketing opportunity and your chance to reach millions. Where to Be Seen Everywhere And Cash In On Your MOJO. Do you ever wonder how many leads and tens of thousands of dollars you are losing every month that your online presence does not professionally match who you are? The good news is you don’t have to wait months or years, you can do it in less than 72 hours. You see, every day that your online branding and presence is not optimized your competition is laughing all the way to the bank. Imagine spending 3 days with me and receiving a fully developed online marketing plan that you can use to reach millions with your message. 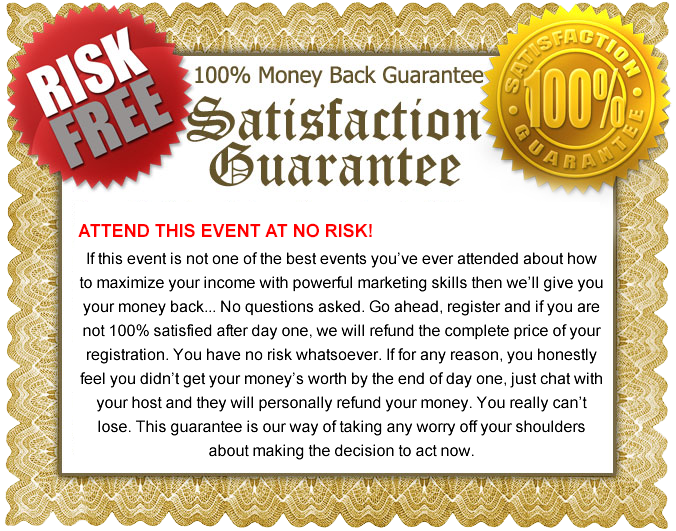 There is no substitute for working on your business, at a live event, with a trainer. This is why I am shutting my office doors and spending 3 days with you so you come away with a complete "blueprint" for your site. Everything you need to take your new or improved website to the world. You’ll get in addition to your trainings, 3 days of live training where I can personally teach you the above, and we can talk directly about your business. That’s a SAVINGS of $500 RIGHT NOW. You and your business needs some honest answers, and I’ll be giving them. Create Automated Streams of Income and Recurring Riches for Life Doing What You Love to Do and Making a Difference in the World at the Same Time. Our first day together is about setting the foundation so you can communicate effectively, look as good online as you do off, and create a community of raving fans fast! We are heading out to the internet and will look at random websites as I show you what you need to be looking for, how to design your site to appeal to your target market and then you will learn how to effectively use copywriting, headlines and keywords on your sites, posts. Today is about reaching millions with your message. Last year alone I impacted 20,000,000 people and I'll reveal exactly how you can do that with a 4 step approach including how to become a bestselling author and the most effective traffic strategies. PS - Your ticket doesn’t expire. You can use it for any event. The next event is Oct. 15-17th in Hollywood, California.